Excel software template puts the most commonly used software commands at your fingertips so you don't have to look them up in the help file or user guide. 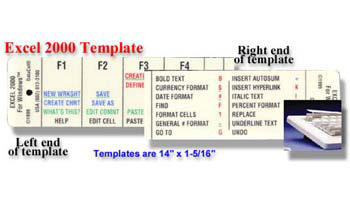 The Excel 2000 keyboard template is made of durable Lexan. It fits across the top of your keyboard putting the mostly commonly used software commands within easy view. The template includes the function key keyboard shortcuts as well as formatting keyboard shortcuts.